With precision agriculture technology advancing fast, detailed field information is vital to placing fertilizer, seed and other inputs precisely where they’re needed. 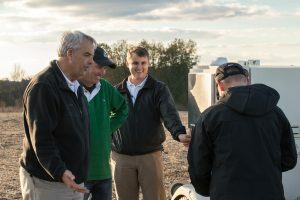 That’s why Monroe, N.C., farmer Allan Baucom custom-engineered the Falcon automated soil sampling system: To help commercial soil sampling operators and other farm input providers quickly collect high-quality samples with unsurpassed precision, consistency and efficiency. Baucom developed the Falcon because soil sampling is still “shovel work” in a fast-paced world of highly automated, satellite-guided precision farming equipment. The Falcon ends the days of time-consuming, labor-intensive, inconsistent and tedious sample collection. Falcon technology delivers better samples, better analysis, smarter input decisions, bigger harvests and increased customer satisfaction. It can support virtually any cropping system throughout the United States. It’s built “farm tough” in the U.S.A. to commercial-grade standards, for maximum reliability and minimum maintenance. Timely, high-resolution soil samples give customers confidence that precision variable-rate fertilizer applications will improve productivity. At recommended field speeds of 8 to 12 mph, the Falcon can collect 40 or more cores every minute as it crosses a field. This enables more cores per sample for higher accuracy – and increases the number of acres sampled each day. Falcon’s superior sampling efficiency allows more cores to be included in each sample, with each core taken at a uniform depth, which dramatically improves sample accuracy and repeatability. Variable-rate fertility programs maximize productivity for each input dollar when they are based on accurate, high-resolution soil samples made possible by the Falcon system.